12 skaters.... that’s nuts for college. Especially nuts considering the team they beat was one overtime goal away from being crowned national champs this past March. That's two frosh d soaking up every other shift and a bomb from Gangarosa from the blue line for first goal of career. Brennerman was solid in net except for fluky first goal in first game that went five hole on a windmill shot from the top of the circle. Penn State looks like big beneficiary of Sauve transfer to Clarkson. Penn State probably wins two if not for that shot. Surprising win in game two based on this team historically getting pounded in game two of a two game series. It's not the same old same old. Just for a visual from this series, have you ever seen a lineup sheet like this? My respect for this coach has gone up a few notches. Players break team rules, players should sit. Too many coaches are all about winning. Rumor says Penn State has their eye on another Swede, and she's 5 ft. 27 inches, and she deadlifts 3 lbs 8000 oz. That is pretty impressive and to think she is only twelve teen years old! I don't know much about Merrimack, except that they didn't lose anybody to graduation after last season, and they're a fairly new program. They have 11 seniors this season. It sounds like where Penn State was a few seasons ago. If you have a read on Merrimack, feel free to jump in and share it - I'd love to have an idea of what Penn State will face this weekend. Merrimack have come at the bottom of Hockey East since they joined, but that's because especially last year the worst teams in Hockey East were really pretty good. Mack have three elite skaters in Katelyn Rae, Mikyla Grant-Mentis, and Paige Voight, and two elite goalies in Samantha Ridgewell and Lea-Christine Demers. Those five would make any team better. The rest of the team is a bit low on speed which gives teams with high breakaway potential a lot of opportunities to score on them. Hard working team, very good to watch, not to be taken lightly, but if Penn State are the team we saw last weekend I expect them to take both games. Penn State came away with a 1-1 OT tie against Merrimack tonight, and should be grateful to get the tie. It was a lackluster effort on Penn State's part, with half-effort from too many players. Natalie Heising scored the lone goal, and there was certainly hustle from a handful of players, but it was not a good showing tonight as a team. After spending this morning watching a lot of the official LionVision video feed from last night, I think "lackluster" was the wrong word to use to summarize the game last night. There was plenty of effort, but as a whole things just looked disjointed. I don't know if it was a matter of putting things back in place after last weekend's suspensions or what, but plays just weren't clicking, passes weren't connecting, etc. They didn't play last weekend's smothering defensive game, either. All in all, the effort was there, but the chemistry wasn't. 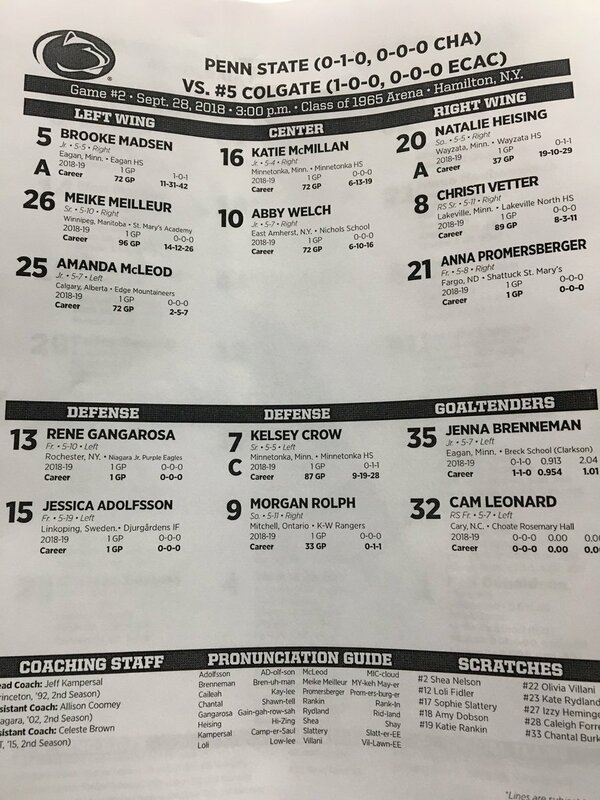 Merrimack is a very energetic team, even on the bench - today should be more of the same, and hopefully Penn State can regroup and connect the dots. Penn State lost to Merrimack today 2-1, with the lone goal coming in the third period from sophomore Katie Rankin. Penn State had a lot of chances, but Merrimack was up to it and played with the same energy as they did yesterday, scoring both their goals in the first period. Last edited by ZedLeppelin; 10-06-2018 at 06:32 PM. In game one against Merrimack, Penn State just got outhustled. There was individual effort there, but no line chemistry at all. It looked like a game one of the season rather than game three, as lines just didn't look dialed-in. Passes were off, decisions took a tick too long, things like that. My guess is that last week's nine-player suspension to open the season threw things out of sync, despite how well the other 12 players did at Colgate. Game two was much of the same, with a lot of individual effort, but plays just looked half a step off. Merrimack was quick to the puck and very determined along the boards, and the smothering defense that Penn State showed against Colgate last weekend wasn't there against Merrimack. Give credit to Merrimack, though - they came to play, and played like they had nothing to lose. It was kind of fun to see all the energy on their bench, too. It was a very good showing from a young program. Penn State is loaded with talent this season, so having an off series this early isn't really a big concern, all things considered. In the exhibition game against Ryerson, they were firing on all cylinders and everything looked ready to go. Last week's Colgate series with a 12-player roster opened some eyes as to what this team can do. This weekend's Merrimack series was like starting the season over, and I expect that Jeff Kampersal and his staff will iron things out in a hurry so players get settled back into their roles. Individually, junior Brooke Madsen and sophomore Natalie Heising are both really on their games, to nobody's surprise. Madsen is fast, she's a playmaker, a relentless forechecker, and just makes everyone around her a better player. Heising is always on her game, always gets herself in the best positions to shoot, and doesn't have an "off" switch - they're both a lot of fun to watch. Sophomore Katie Rankin works her tail off and looks anxious to step her game up another notch after an already good freshman season. She's a workhorse, has a rocket of a shot, and does good work in the faceoff circle. Those are my own top three players, but Kampersal has a lot of talent to work with this season. Led Zep for Penn State and Lisa T for Vermont are great for this site. Great info, enthusiasm, links and videos. Thanks on behalf of women's hockey. Penn State faithful were let down this weekend for sure. Shortened bench and rolling lines made State look great first weekend and .... Just when you think maybe it was Colgate, they knocked off Ohio State to split. Union could be just the prescription. Led Zep for Penn State and Lisa T for Vermont are great for this site. Great info, enthusiasm, links and videos. Thanks on behalf of women's hockey. Thanks very much for that! I appreciate everyone who posts for their team, too, because I like having something to read beyond the standard official game recaps. Penn State faithful were let down this weekend for sure. Shortened bench and rolling lines made State look great first weekend and .... Just when you think maybe it was Colgate, they knocked off Ohio State to split. Union could be just the prescription. Penn State has Union and Providence, and then they jump right into the conference fire against the beast named Mercyhurst, so they better have their stuff together by then. I think they will. They just need one solid win to get themselves back on track, I think. There's too much talent on this team to worry much about the Merrimack series. I was surprised to see Colgate take one from Ohio State, but it made Penn State's "short bench" win against Colgate feel that much better. This past Saturday's game against Merrimack set a new attendance record for Penn State women's hockey at 1,804. To be fair, it was a promotional weekend - anyone who bought a ticket to the women's game got a free pass to the men's game immediately after. I sure wish we could draw those kind of numbers on a regular basis.